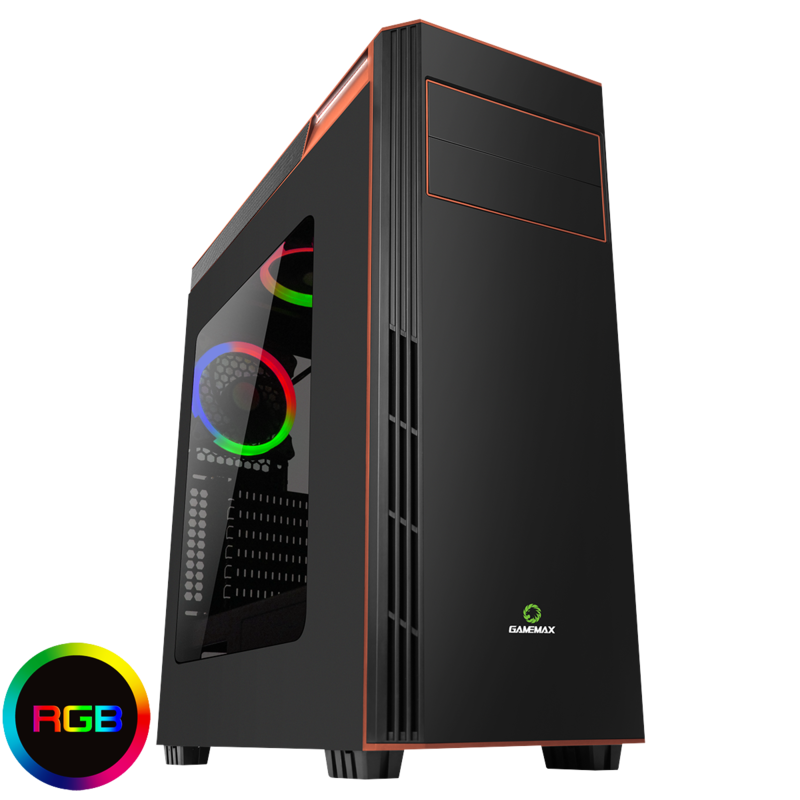 Changing the game for 2018 Game Max have introduced the Gamboge RGB Midi Gaming Case with a half side acrylic and steel window. 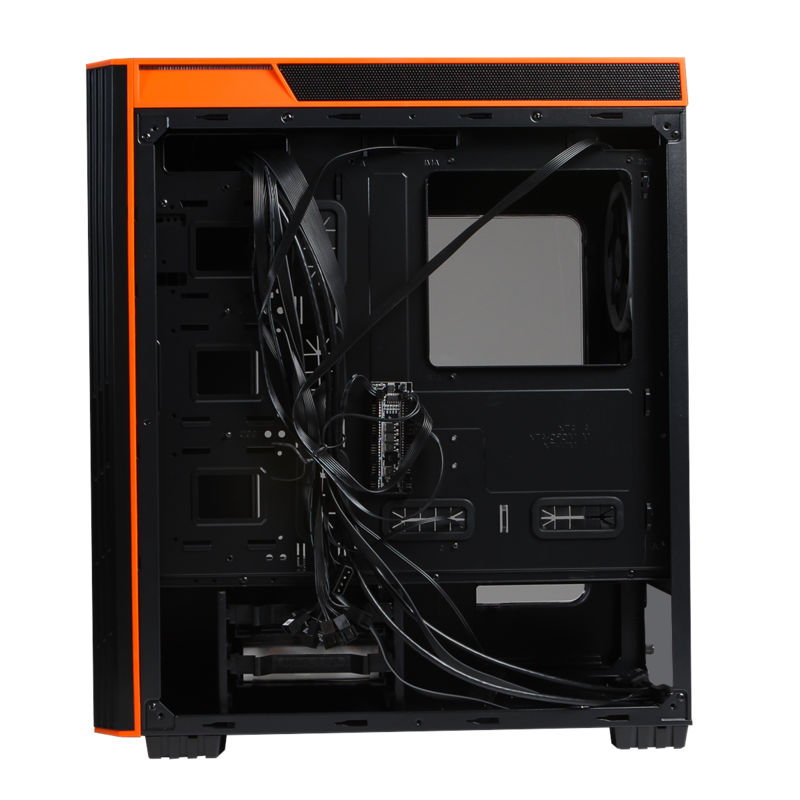 The case comes with two Dual-Ring Halo RGB fans pre-installed and two LED strips to offer great cooling and lighting. A PCB hub is included allowing you to control up to 10 devices, 8 fans (6pin) and 2 LED strips (4pin). A remote control is included meaning you can change light mode, brightness and fan speed without having to take your eyes off what matters, the game! Along with 2 fan controllers at the top there are 2 x USB 3.0 and 2 x USB 2.0 on the top to give the user easy access. The I/O ports allow you to connect to most media storage devices. The Gamboge comes in at over 200mm wide, with a more than ample space behind the motherboard panel, giving it exceptional cable management support. Coming in with 0.7mm SPCC Steel, the Gamboge has outstanding quality and value. 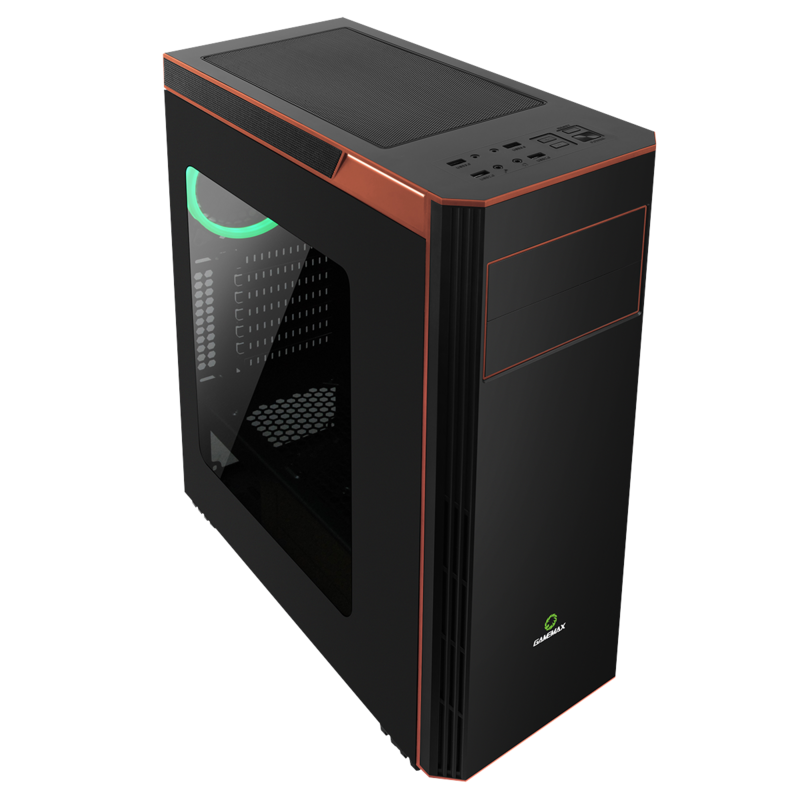 Design – The Gamboge from the outside looks a very simple design but the added orange along the top, front and bottom of the case gives the exterior a nice finish and the interior offers amazing scalability and convenience and is a premium high strength case. 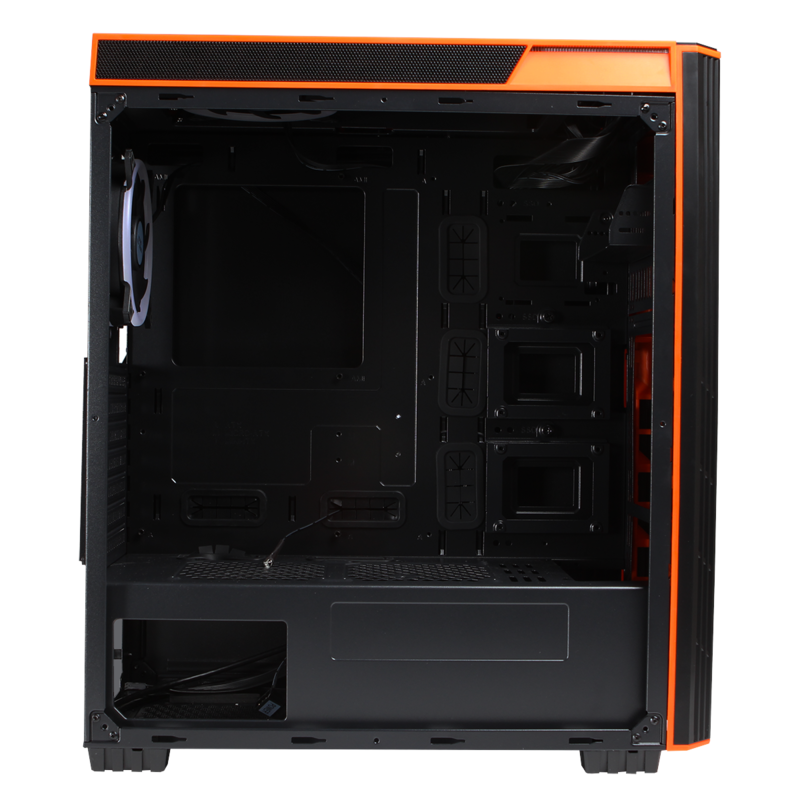 Acrylic Side Panel – Left half side acrylic and steel window offers a direct view of the inner system, allowing you to show off your internal components and the acrylic side panel means your case will be strong and durable during use. RGB Fans – The Gamboge comes with 1 Dual-Ring Halo RGB fan at the top and another at the back to give your case some added colour. PCB Hub & Controller – The Gamboge comes with a PCB hub and remote controller it allows you to connect to 10 devices. Having the hub included keeps your chassis interior clean and tidy. The remote controller allows you to light up your fans 7 different colours (Red, Blue, Green, Cyan, White, Purple and Yellow), as well as being able to change the colour of the fans the remote control comes with 7 single colour breath effects and 5 preset modes. Water-Cooling Support – The front supports 120mm, 140mm, 240mm and a 280mm radiator, the top supports a 120mm or a 140mm radiator and the rear of the case supports a 120mm radiator. I/O Ports – The top of the Gamboge is designed with 2 x USB3.0 and 2 x USB2.0 and comes with HD audio and a mic to allow to connect to a wide range of devices.